Mach 2.2 speeds with business-class fares and profitability—a game-changer for airlines and passengers. 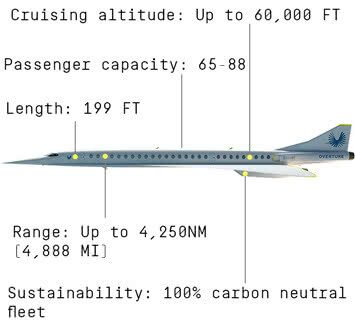 With seat-mile costs similar to subsonic business class, supersonic flight is practical on hundreds of transoceanic routes—making it the new norm for anyone who flies business class. All-business-class interior designed for comfort, privacy, and productivity. Personal under-seat storage lockers replace overhead bins, allowing more headroom and easy access to luggage. Window or aisle? No need to choose—each seat has a large, personal window and direct aisle access.